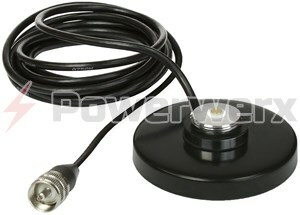 Compact size magnetic mount dual-band antenna w/ coax cable which is ideal for emergency or portable car operations. 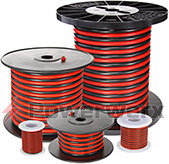 Antenna is cut for 145-165/430-467 MHz and is 18 inches in length and supplied with 12 feet of coax cable. 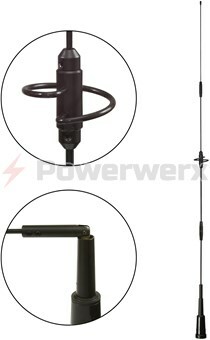 This dual-band antenna offers 1.7 dBi gain VHF / 4.15 dBi gain for UHF. The ANTMAG features a black finish and has coax cable connected to PL-259. Also included are SMA-Standard and SMA-Reverse antenna adapters/connectors. 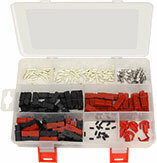 Fits Models: TR-590, TR-500, TR-505, DB-750X, KG-UV6X, KG-UV3X Pro, KG-UV3D, DB-16X and more. I have now owned this magnetic mount antenna for about 1 year. I probably leave it attached to my vehicle about 1/4 of the time. At highway speeds, to 80 mph, it does not move! It has been very durable. Of course, the coax cables on the antenna and transceiver are smaller, and require care in screwing them off and on. But the smaller antenna and connectors make routing the wire thru the vehicle a snap! Just be careful when making the switch to your duckie; they are a little delicate. Buy it with confidence and... ENJOY!